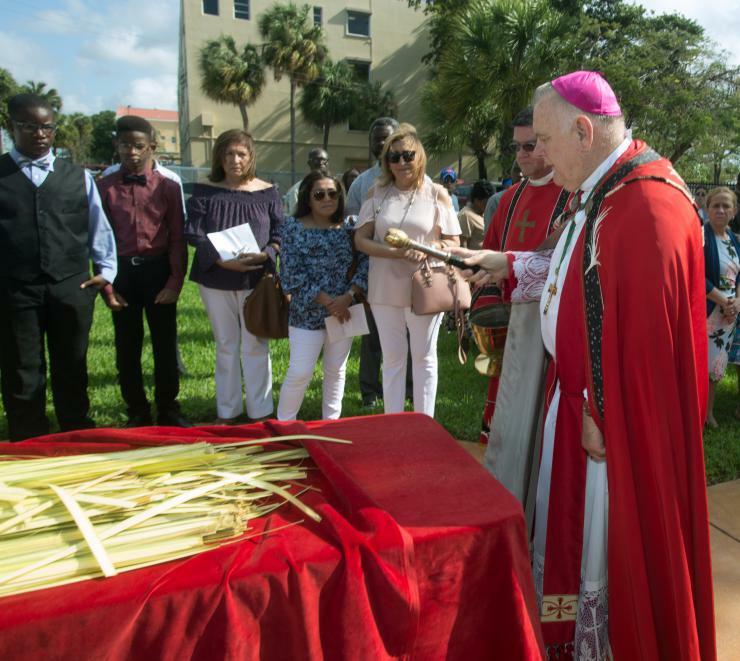 Archbishop Thomas Wenski blesses palms outside St. Mary Cathedral at the start of Palm Sunday Mass April 14. 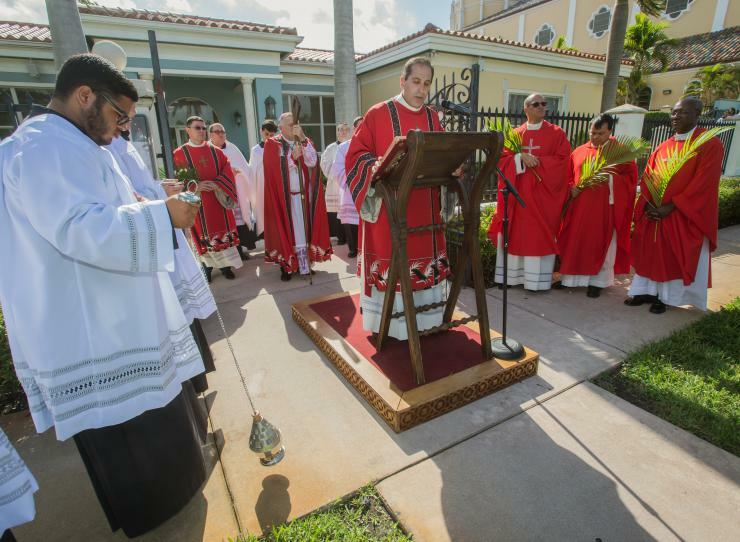 Deacon Sergio Rodicio reads the Gospel after Archbishop Thomas Wenski blessed the palms at the start of Palm Sunday Mass, April 14, 2019. Mass-goers pick up the blessed palms at the start of Palm Sunday Mass, April 14, 2019. Archbishop Thomas Wenski, far right, along with cathedral priests Father Lesly Jean, far left, and Father Christopher Marino, center, wait to process into St. Mary Cathedral for Palm Sunday Mass, April 14, 2019. 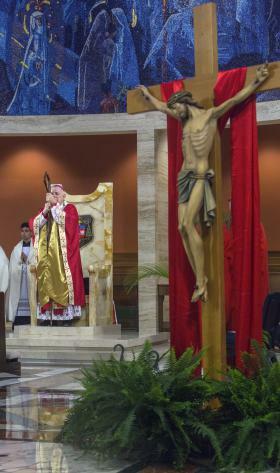 Archbishop Thomas Wenski celebrates Palm Sunday Mass, April 14, 2019. 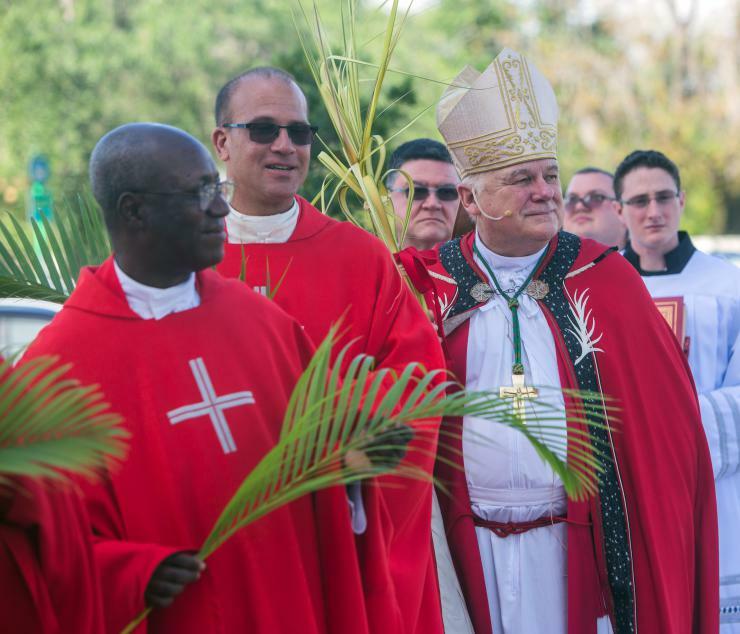 Archbishop Thomas Wenski preached this homily on Palm Sunday, April 14, 2019, during Mass at St. Mary Cathedral, Miami. On Sunday, Palm Sunday, Jesus entered Jerusalem in a parade filled with cheers; on Friday, Good Friday, he leaves Jerusalem in a parade filled with jeers. The drama of our Palm Sunday liturgy does not merely recall those tragic events of 2,000 years ago when an innocent man was put to death, it also unveils for us the reality of man’s continued inhumanity to man, an inhumanity on display in current events in which thousands, even millions, of innocents continue to die. It is easier for us to deceive ourselves by thinking that were we there “when they crucified our Lord,” we would have acted differently than the crowds who shouted out for his death, that we would have behaved with more valor than the ambitious yet cowardly Pilate, that we would have comported ourselves better than the fearful and weak-kneed apostles. It is easy to say, that were we there, we would have been among those raising cheers and not among those hurling jeers. Yes, it is always easier to deceive ourselves than to recognize our complicity in it all. The Scriptures, however, remind us: Jesus died for us, but he also died because of us. And woe to those who deny their guilt and project it on to others. 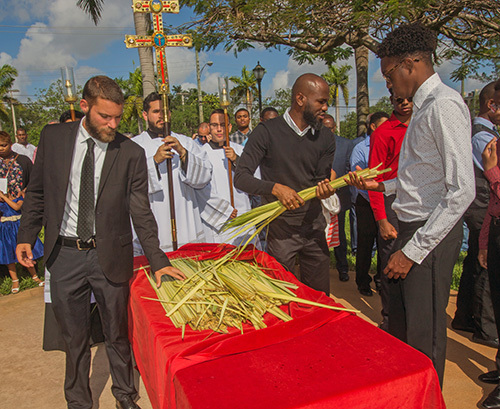 Mass-goers pick up the blessed palms at the start of Palm Sunday Mass, April 14, 2019. Jesus, though innocent, suffered grievously. “He who was without sin was made sin.” He shouldered the weight of our sins as he dragged his cross to the place of his execution. In his humanity, Jesus shows solidarity with human pain and thus confers on our pains, our sufferings, our miseries a divine meaning and significance. The Son of God shares in our humanity to makes us sharers in his divinity. We were created for glory, the glory of life in God, the glory of Eternal Life: but Jesus shows us that the road to that glory passes through the Way of the Cross. Now, as then, we find the executioners: with sarcasm and cynicism, they murder the innocent; if not by deed then by their words they destroy the good name of their brother or sister, crowning them with thorns of mental anguish. To hell with Christ, they shout out. Damn his compassion, his mercy and his invitation to conversion of mind and heart. “We have a law – and he must die!” they say. Yes, Jesus entered Jerusalem in a parade of cheers; he leaves in a parade of jeers. Palm Sunday and this Holy Week that follows is an invitation to each of us to join Jesus’ parade. The Passover feast recalls the exodus of the Hebrew people, their “coming out” of the slavery of Egypt and into the Promised Land. We must make our own exodus – and come out of our selfishness. As the Hebrews left behind the fleshpots of Egypt, we too must leave behind our silent indifference, our easy compromises; we must leave behind our complicity with the suffering of those who today represent the disfigured face of Christ –the poor, the migrant, the weak, the excluded. Christ dies to save them – the last, the least, the lost. He dies to save us. Jesus enters Jerusalem knowing what awaited him. But he goes, because we matter to him. “God so loved the world, that he sent his only begotten Son to save the world.” Does he matter enough to you that you join his parade? If he does, then join the parade — you may find more jeers than cheers if you follow him; but he shows you the road to true Glory — not worldly glory but heavenly glory. That’s where the parade ends — in glory; but as the Scriptures remind us this Holy Week, the road to Glory passes by the way of the Cross.